For far too long, Ni No Kuni’s been on my shelf. I had twelve hours into it when it first came out and then I got distracted. About a year or more (since time is crazy after a while) later I finally got back to it. It started off as the same game I loved back when I started out. Now, having defeated the game, I return victorious with the tales of my miss adventures from a land filled with a good story about friends, fate (kind of) and some fairly (pun intended) funky creatures. Just another day in the life of a simple child getting ready to start an adventure way bigger than himself. What most ensnared me into the world of Ni No Kuni was the art style. The majority of the game feels like you’re watching an interactive Studio Ghibli film and it just oozes fun and adventure. The main protagonist Oliver is just a kid thrust into the act of saving two parallel worlds from destruction with his fairy pal Mr. Drippy. At first it doesn’t seem like the world’s path is the typical “destructive end” that worlds on the eve of destruction usually meet. The world seems to be being brought to an end with ailments of the heart. It’s weird but I guess it works and makes the fetch quests a bit more acceptable in the beginning. Mr. Drippy was an interesting character to say the least. Once he was finished insulting Oliver he was actually rather endearing. His super saving move that heals when the party gets really low was more like a legend that only came out when almost everyone was already down… thanks Mr. Drippy… thanks a lot. That is what a decent chunk of the game feels like it’s focused on. (That is if you ignore combat(do I mean level grinding?) and story.) 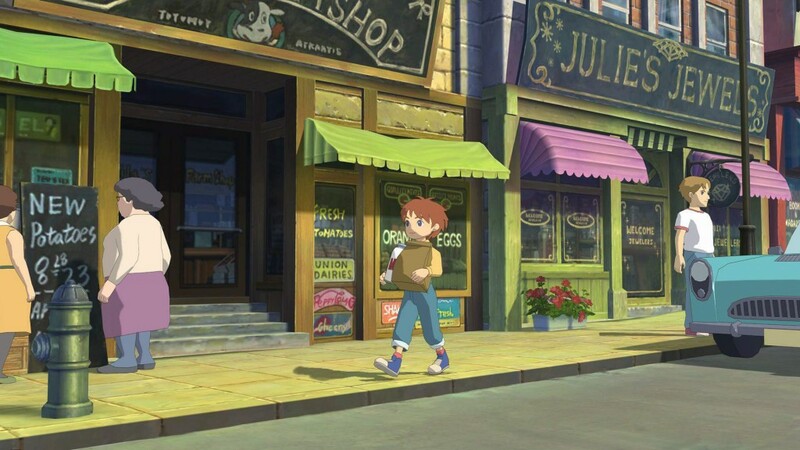 The majority of what you’ll be doing in Ni No Kuni is running around trying to find what part of a person’s heart is missing and stop them from being super emotional or cranky as all get out. You run amuck to find someone who’s heart is brimming with either love, kindness, enthusiasm or any of the other emotions, borrow a bit using some magical, emotion draining necklace (because why not), and share it with those that lack the corresponding piece of heart. It’s not super complicated, but it does get a bit repetitive as anyone familiar with MMO fetch quests could tell you. You’ll end up dealing with either the same situation or same couple of people who just move about from city to city and end up having the same quest. This is how the whole game turned out eventually. I’d hunt down some part of the same guys diary in every town. I’d collect different familiars for another NPC. There’s also a fair amount of random emotion hunting quests to go and find a piece of a person’s heart here and deliver it there. Like I said, this part of the game does get rather repetitive and that would really have dragged the game down had it not been for the story. Well, that and the bounty hunting quests. You’d be sent all around the world finding and hunting down familiars that are mostly pretty cool and way more powerful than any of your familiars and after you beat them, you get no chance of taming them. That was kind of a letdown. Either way, it was decently fun. As I’ll mention, the combat is reminiscent of the Tales series. I’m a fan of the free-flowing combat. I just wish the friendly AI was better. The story was great through and through. Like I mentioned before, you are trying to save two parallel worlds from destruction from a bad guy named Shadar. It has its annoying parts (like how movies get) when the characters are thinking that Shadar is the end-game while you know better and you’re simply wondering when this White Witch is going to show her mug. However, that is really only at the end of the game (mostly). Shadar will actually pop in from time to time to throw a bigger baddies at you in an attempt to stop your journey, however he really shines during his boss fight. I think Ni No Kuni would have been even more enjoyable had I solely fixated on the story, but you almost need the side quests to help level-grind yourself up to be able to compete. I would talk more about the story, but I would rather you experience it first hand. Puzzles! I do enjoy puzzles… except when clue doesn’t really help. This isn’t that puzzle, but man… that was frustrating. 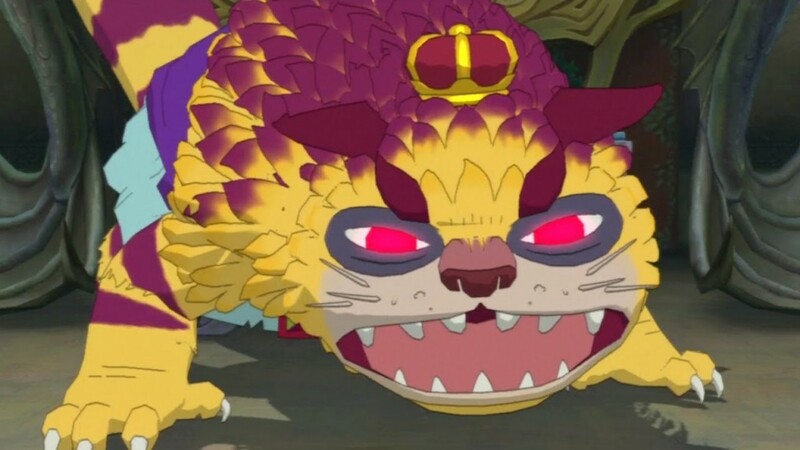 Some of you are probably wondering when I’m going to start calling Ni No Kuni a Pokemon rip-off. 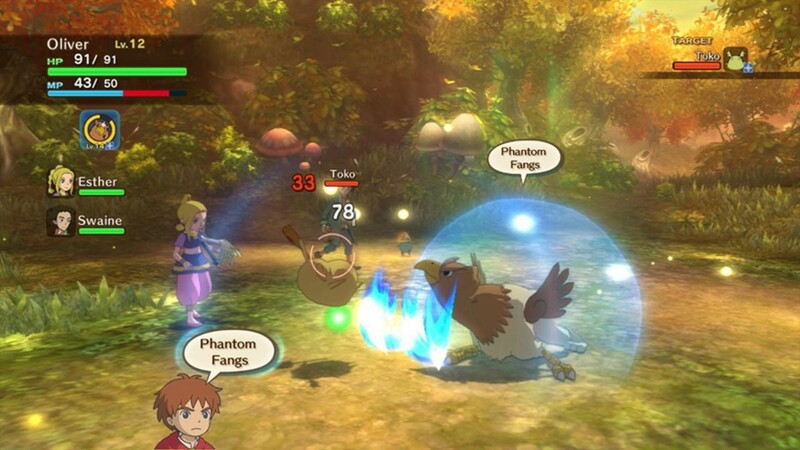 Get lost enough in the world of Ni No Kuni and capturing the creatures can start to feel like Pokemon game with a Tales series vibe. Here’s my advice: don’t get caught up in the “gottah catch’m all” drive that almost consumed me. Find what really works for you (or in my case, looks the coolest and does the most damage) and stick with it. Give Swain some familiars that have a tank ability and/or some cool buffs and give Esther some healing familiars and forget about it. I simply did my best to match them with the types that they would be best suited with given what the game told me. The only reason I’m giving this “lazy approach” advice is because the AI is fairly stupid when it comes to mana management. As in: they can’t manage mana at all. Unless of course you mean “waste it all as soon as each and every fight starts”. If that’s the case, your teammates are tactical geniuses. Your buddies can damage well, but like the last fight in .hack, I hate almost being forced into a roll, be it healing or buffing, when the rest of the game is spent fighting. Set your healer to heal the party and she shoots out all sorts of nasty moves. Tell your other guy to back you up with support because there is no freaking “tank the boss” option (which really comes off as a crazy option to leave out when setting up trinity units). Take control of whatever setup fits you the best because switching characters also blows. If and when you switch they will unsummon their familiar. That really blows when you switched characters to use a move that your buddy’s already summoned familiar has. Hopefully it wasn’t going to be a clutch heal. Just when you think it’s over… Zombies! The last thing that bothers me is buffing and heals. While they are a good thing and nice to receive and give, this is where Ni No Kuni’s inner Monster Hunter comes in. Whenever you get buffed or healed it stops you in your tracks. During the trash fights you probably won’t notice it. When those boss fights roll around and you get stopped in front of a nasty attack just for some buff that isn’t worth it, it can really make you want to break a controller in half. When the fights start getting tough, it only gets more frustrating. Maybe if there was an independent button that could call out for heals or something… maybe. Had this been a review on what could have been a most excellent anime movie, this would have been an easy “Tasty!”. However, this is not a movie, but a videogame with cut-scenes in it. I wanted to give it a lower score to show my disdain for the things that really annoyed me because they really started to shine during the last half of the game and it got fairly annoying (especially during the boss fights when a “heal” would drop on me and keep me in place and effectively killing me.) On the flip-side of the coin though was the story, characters and aesthetics of the game that gave hope when there wasn’t much to be had. Everything about this game was happy looking and made slogging through a lot of what I did do (some grinding) acceptable and that’s impressive. That’s not to say I didn’t get super frustrated, but I was able to be pacified shortly there-after. 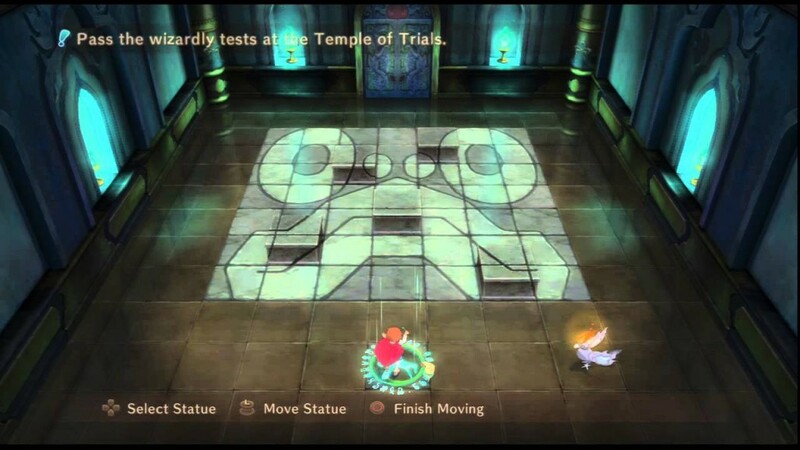 Would I recommend playing Ni No Kuni before the sequel? Yes I would. Had the sequel not been announced as coming somewhat soon I’d say you could hold off on it for now. It’s coming for the PS4 and you’d best be ready if you’re one of those people who likes to have the prequels defeated. There is more to the game if you want it, but I could only take the level grinding for so long. As for now, it’s gonna go collect some dust until my kids want to play it later in life.